Flagstaff, AZ – The Coconino County Sheriff’s Office Search and Rescue team conducts operations to assist skiers and snowboarders in the backcountry. Each ski season when there is ample snowfall, skiers and snowboarders enjoy backcountry runs out of the permit area of the Arizona Snowbowl. 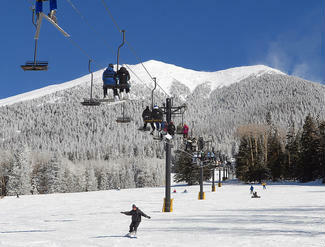 People leaving the ski area off the south or front face of the San Francisco Peaks often intend to ski back to the Snowbowl, but find the terrain pulls them downhill and away from the Snowbowl. Many skiers and boarders get lost, stuck or injured and call for help. For several years, the Sheriff’s Search and Rescue Unit has conducted what is known as a Preventative Search and Rescue (PSAR) operations to mitigate the chances of people becoming lost or turned around. One such operation is to put a track from a snowcat on Forest Road 522, also known as the Freidlein Prairie Road. Should a person become lost, the track gives them a recognizable path back to Forest Service Road 516 (the Snowbowl Road) and has helped to reduce the number of search calls. Last week, the Search and Rescue Unit conducted another preventative operation by cutting snowshoe tracks along the Kachina Trail. The track was laid from Snowbowl to an area known as the “First Gully” in hopes of catching lost skiers earlier and higher up the mountain and giving them a path back to Snowbowl. Out of bounds travel has some associated hazards. The backcountry is not patrolled, and no avalanche mitigation is conducted in the backcountry. It is important that backcountry users be familiar with the conditions. Information about the snowpack is available from the Kachina Peaks Avalanche Center. The Kachina Peaks Avalanche Center also offers avalanche safety education. A Kachina Peaks Winter Backcountry Permit is required for backcountry travel in the Kachina Peaks Wilderness when accessing the Wilderness from Arizona Snowbowl and along the Snowbowl Road at Viet Spring and Freidlein Prairie Road. The permit can be obtained for free from the U.S. Forest Service. More information about the permit can be found athttps://www.fs.usda.gov/detail/coconino/passes-permits/recreation/?cid=fseprd479744. In addition to knowledge about the conditions, backcountry users should carry the 10 Essentials plus a charged cell phone and spare battery, avalanche transceiver, backcountry shovel, and avalanche probe.